The welcome reception is open for all conference delegates and will take place 18:15-19:30 at the conference site, Eigved Pakhus. The reception is co-sponsored by the International Journal of Care and Caring (IJCC), at Policy Press. Members of the IJCC’s editorial team and Editorial Advisory Board will be available at the reception to discuss the remit and purpose of the journal and opportunities to publish with IJCC. Also, the winner of the 2017 Transforming Care Conference/IJCC best paper will be announced. For those who have purchased dinner tickets, a boat will leave from Eigtveds Pakhus at 18:45 and will take us round the harbor to see the main sights, before dropping us of at the restaurant. The conference dinner takes place at restaurant Toldboden, Nordre Toldbod 18-24m, 1259 København K, https://toldboden.com/en/ See map below. Transport from the restaurant to your hotel, is on your own. 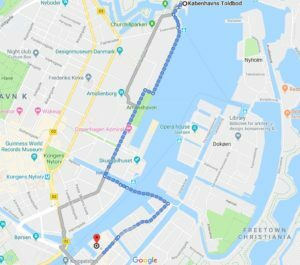 We recommend a nice stroll along the habour side, see the map below where the route to Eigtveds Pakhus is indicated (2.4 km). If you want to organize public transport to/from the restaurant , you can use this planner tool for public transport, https://www.rejseplanen.dk/webapp/index.html?language=en_EN. Otherwise, the conference secretariat at Eigtveds Pakhus is happy to help you organizing a taxi.